HMH Books for Young Readers, 9780547763415, 112pp. Jo Schmo comes from a long line of crime fighters, but she’s just a normal fourth grade girl into boys and skateboards—until her uncle’s cape arrives on her San Francisco doorstep. Time to join the family business! Gramps shows Jo the tricks of the trade, and her dog, Raymond, becomes her slobbery sidekick. Just in time, too. 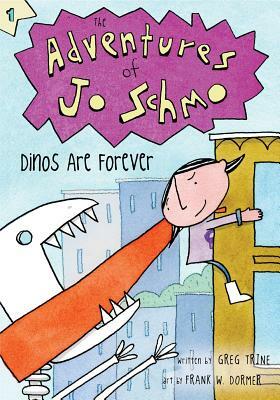 Can Jo stop Dr. Dastardly and his deadly gang of dead dinos? Stay tuned for more adventures of Jo Schmo, complete with hilarious black-and-white illustrations.